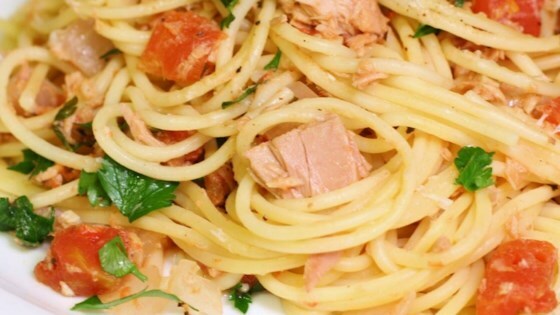 "Canned tuna is used to make this yummy tomato sauce. Use pasta of your choice." In a large saute pan, heat oil over low heat. Add onion and garlic; cook and stir until onion is tender. Stir in capers, tomatoes, lemon juice, and parsley. Season with red pepper flakes to taste. Simmer gently for 3 minutes to thicken sauce. Fold in tuna, and heat through. While sauce is cooking, add pasta to a large pot of rapidly boiling water; cook till just tender. Drain well. Toss pasta with sauce, and serve. For more flavor, use oil-packed tuna and add a little lemon zest along with the juice. I also throw in lots of kalamata olives. nice and simple! I rinsed the tuna to take out some of the salty flavor.